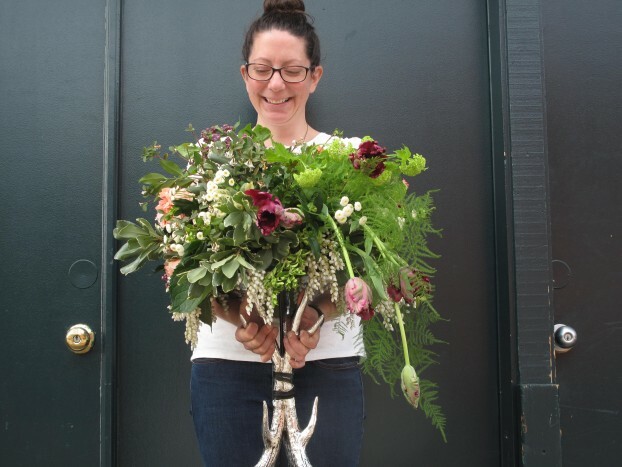 This week’s guest is Eleanor Blackford Davis, owner of Seattle-based Bash & Bloom. Eleanor and I frequent the Seattle Wholesale Growers Market where she is a regular customer and I’m on the board. It’s always fun and tempting to see what she has loaded in her arms on those early-morning excursions – and there’s often a fabulous related story she shares about a wedding or event in the works. Eleanor and I got to talking last year about her decision – and her public announcement – to go foam free as a designer. 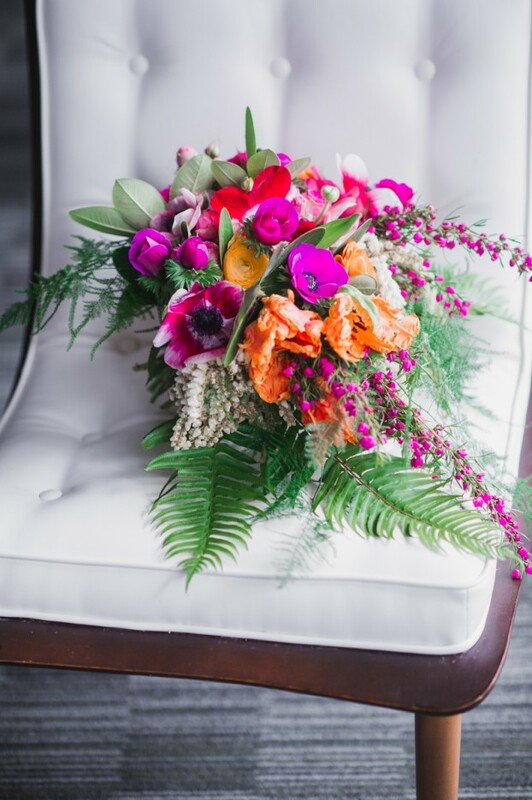 She also believes in sourcing from local farms and through the Seattle Wholesale Growers Market, whose staff members procure only local, seasonal and sustainably-grown flowers from Washington, Oregon, Alaska and California. My photograph of Eleanor Blackford, with her sample arrangement using local spring flowers and Floral Soil. Eleanor’s finished design, a prototype for her wedding reception. We continued the dialogue recently while both participating in a workshop to use Floral Soil, a 100-percent plant-based alternative to the conventional foam, invented by Mickey Blake, a past guest of this podcast. 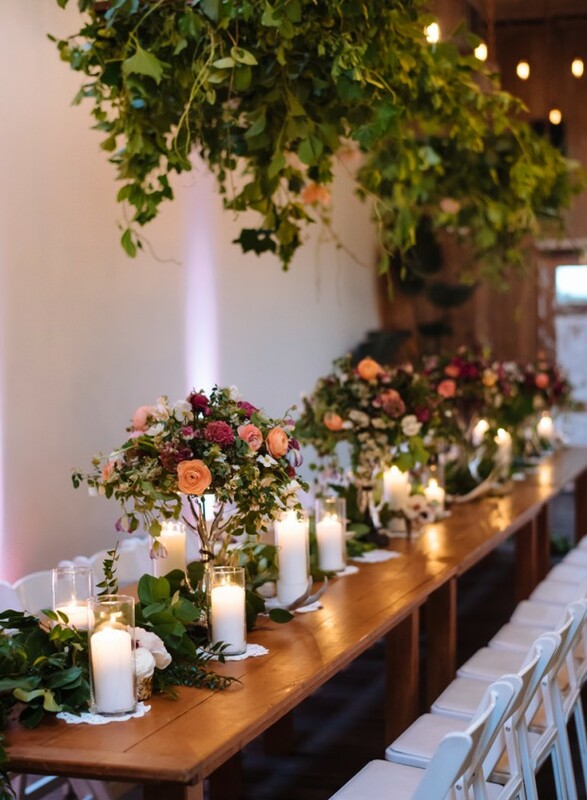 Alicia Schwede of Flirty Fleurs, another past podcast guest, led the workshop on designing elevated centerpieces, and I have to tell you that Eleanor’s piece was stunning! 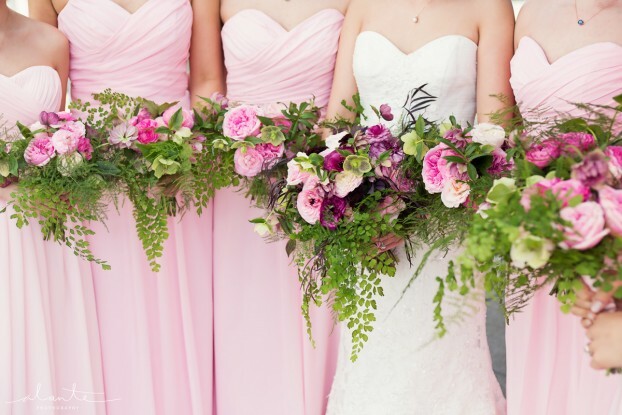 It was also the prototype for her own wedding florals, which took place on May 8th. 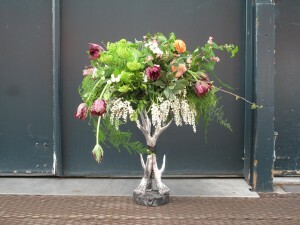 Check out the no-foam elevated centerpiece she created at the workshop with Alicia and Mickey. But about five weeks ago, Eleanor and I agreed to meet over tea to record our conversation, and I know you’ll enjoy it. 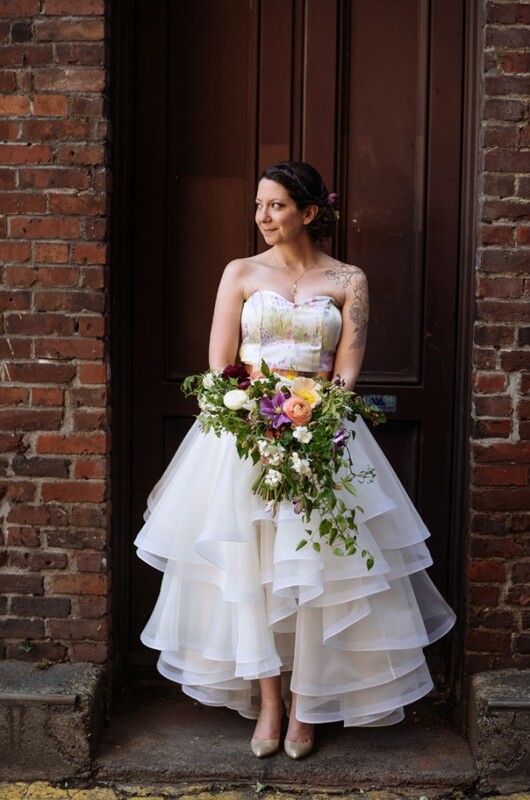 I’m happy that Eleanor has shared so many photos of her floral design work and a few bonus photos from her recent wedding to Matthew Davis (see below). 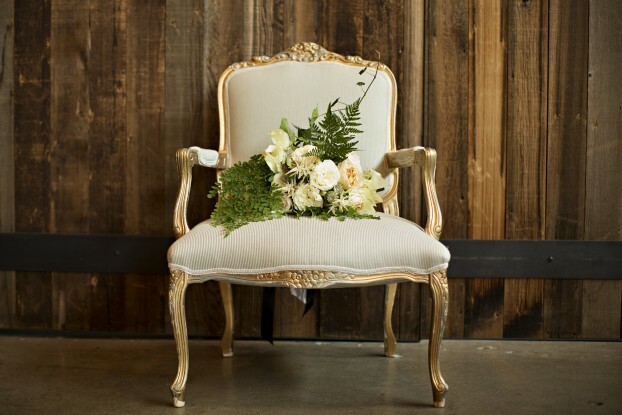 The Greater Seattle Floral Association, the local organization for wedding, event, studio and retail designers in which she is actively involved. 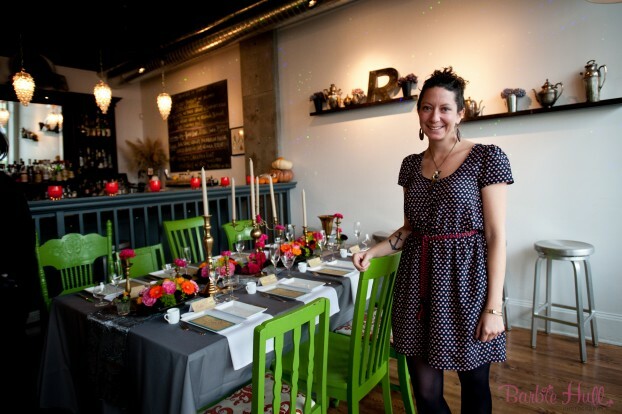 I’m Eleanor Blackford – a craftster, dog lover, fun haver, and Owner of bash & bloom. My style has been described as having a lush, organic, and creative look and feel. I love to make an event unique, personal, and fun and can’t wait to sit down with you to talk about your vision. 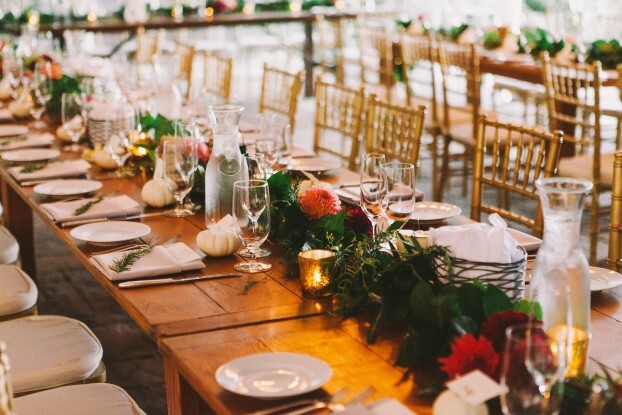 I work closely with my couples or party hosts to bring their unique personality and style to their event, primarily using seasonal and local products. 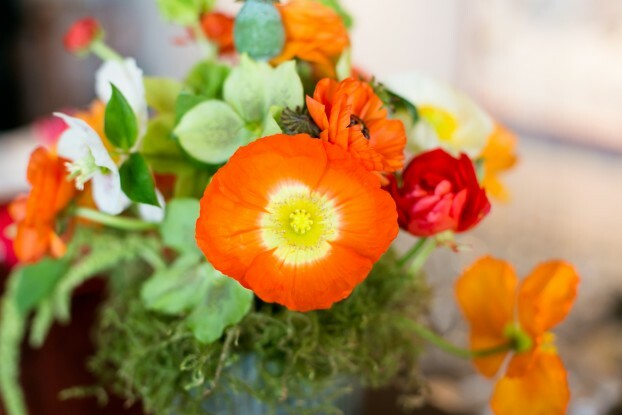 Thanks again for joining me today for another wonderful conversation about American flowers and the designers and farmers who are changing this entire industry for the better. Listeners like you have downloaded the podcast 50,000 times. I want to stop for just one moment and savor that news. Yes, we just produced our 96th episode and we are very, very close to airing the big one-hundredth episode, just one month from now. THANK YOU to each and every one of you for downloading, listening, commenting and sharing. It means so much. 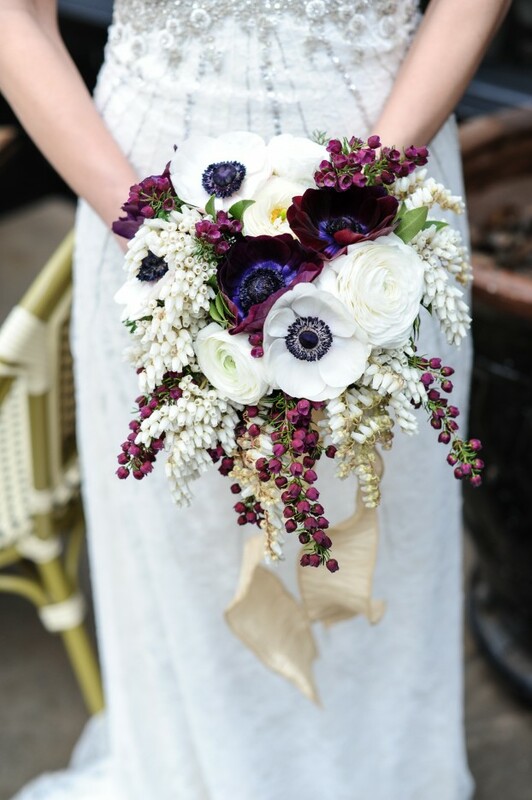 This entry was posted on Wednesday, May 27th, 2015 at 11:05 am	and is filed under American Grown, Blog Posts, Creativity, Entertainment, floral design, General, Playfulness, Podcast Episodes, SLOW FLOWERS Podcast, Slowflowers.com the Directory of American Flowers. You can follow any responses to this entry through the RSS 2.0 feed. You can leave a response, or trackback from your own site.